Allow me to introduce you to a little know business gem: Timpson. It is a family business operating 1000+ stores, annual turnover in the region of £200m, and annual profits of £10m+. Today, this organisation (and its leadership) is on my mind again. Why? Because of what I saw and read on LinkedIn. The shape-look-feel-character of humanistic leadership: authentic as opposed to faking it in order to manipulate others (publicity stunt); thoughtful and caring as opposed to thoughtlessness and indifference to our shared humanity – where humanity is hidden under the labels of customer, employee, supplier; and selflessness leading to paying it forward as recognition of one’s good fortune and shared humanity as opposed to unlimited greed dressed up in fine sounding words like maximising revenues and profits. The impact human-centred leaders make on us: we tend to think of this kind of leadership as “leadership at its best”; and those who exercise this kind of leadership call forth respect – when we are authentic we take our hats off only to those whom we genuinely admire, esteem, respect in terms of their virtues and/or skills. The benefits that tend to show up as result of exercising humanistic leadership: the good feelingthat this kind of leadership calls forth in just about everyone except sociopaths and those professionally trained as economists and MBAs; and the advocacy-loyalty that is automatically brought into play as a result of evoking this good feeling. I am clear that we (those of us living in the UK and USA) live in transactional, individualistic, non-humanistic, competitive cultures. So those of us, who are ‘smart’, are likely to be tempted to fake humanistic leadership to get the benefits (respect, status, increased profits, wealth) without paying the necessary ‘price’. So here’s the paradox. The exercise of humanistic leadership does generate advocacy, loyalty, revenues, and higher profits. However, this is not the case when humanistic leadership is exercised for the sake of harvesting these benefits. Why? Because, one can only fake it so long before true intentions leak out and are detected by those who are being manipulated. 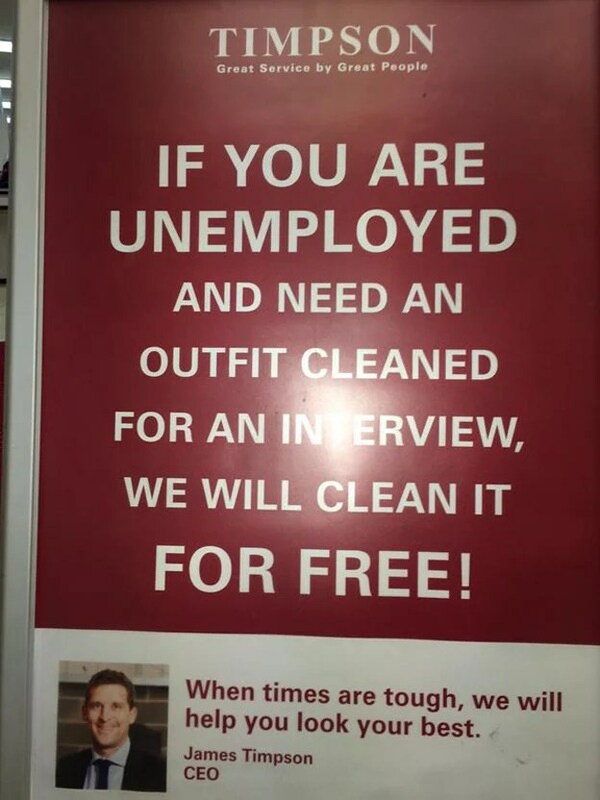 The problem is that getting suits dry cleaned usually costs in the vicinity of £10, which can be prohibitive for unemployed people looking to return to work. What is going on here? How to make sense of this? It occurs to me that somewhere deep down in us, our human decency is intact. Put differently, for most of us, there is something deep in our being that makes us think twice and usually prevents us from taking advantage of those who show concern for us, our fellow human beings, and our shared humanity. Where we transgress and do take advantage of the kindness of others, guilt comes into play. That is the price we pay for not honouring the best of our humanity. Now you may be wondering what this has to do with Customer. I say take a look at what has been done in the name of customer service. Take a look at CRM. Take a look at customer loyalty programmes. Take a look at Customer Experience. Take a look at all that has happened and all the money-effort that has been expended in the name of the Customer. Now ask yourself how it is that despite all of this customer loyalty and employee engagement are stagnant – at best. There is your answer: humanistic leadership (and management practices) are the access to calling forth the good feeling that in turn leads to engagement-loyalty-advocacy: from your people, from your suppliers/partners, and from your customers. If you are interested in learning more about Timpson then check out this piece that I wrote some time ago as it continues to be relevant and instructive: Timpson: Shifting-Transforming Culture Through Language and Practices. Note: At the invitation of Bob Thompson, I write the Human-Centred Leadership column on CustomerThink.com. This conversation was published there last month. You may have noticed I have not been conversing much recently here on this Blog. I have been dealing with back pain for the last six weeks. This has limited by ability to do that which it takes to create-share conversations. I hope to back in action soon. If you missed me then I thank you for your patience. If you didn’t, excellent: now you know that you are wasting your time-life listening to me, please go and do something that lights you up! Note: this conversation was originally published here on the CustomerThink site.